I love how you share your influences from poetry and art. Gorgeous Cormorant! Thanks so much! I love the community here and really trying to broaden it. I love connecting creative people together; it really warms my heart. So much creative wonderment to be found here at WP. Really glad you enjoyed this painting! Thanks again! Sharon, thank you so much! I do feel like I’m starting to find my wings. I may be one who is better with a hard implement than with a brush. At least, I approach it with more confidence. Those Neos give me a big leg up! Thinking about trying pastels as well – not sure if you’ve heard of Debora Stewart, but I read her book last summer and now I’m going to check it out again. She inspires the heck outta me! Anyway, I’m gonna get off this PC and go do something fun. Thanks for the encouragement, Sharon! Gorgeous. You seem like you are Really feeling loose and free and confident. Love it ! Thanks, Jodi! The Neos are huge for me. So much more control, and I’m enjoying that at present. Palette knife, also fun, as you know! So many options……hehe. Have fun today! Great movement and pose! ❤ We have pics of cormorants sunning themselves with their wings up and outstretched. They're so funny to watch! Thanks, Teresa! Helps to have a terrific photo reference. So many at that link. I just love birds in flight or poised for the leap! Oh those colors layered so beautifully! Yes this is your medium Laura, absolutely stunning! That blue! Super love! Thanks, Cathe! Those Neos really make everything so fast and simple and beautifully expressive. Just love them. So glad you like this piece! Thanks, Rachel! The magic of Neos. They’re truly amazing things. The colors really make the bird! Beautiful work. This is really fabulous Laura!! I love the limited color… it’s really graphic and cool. And as ever, wonderfully rendered with a great personality! 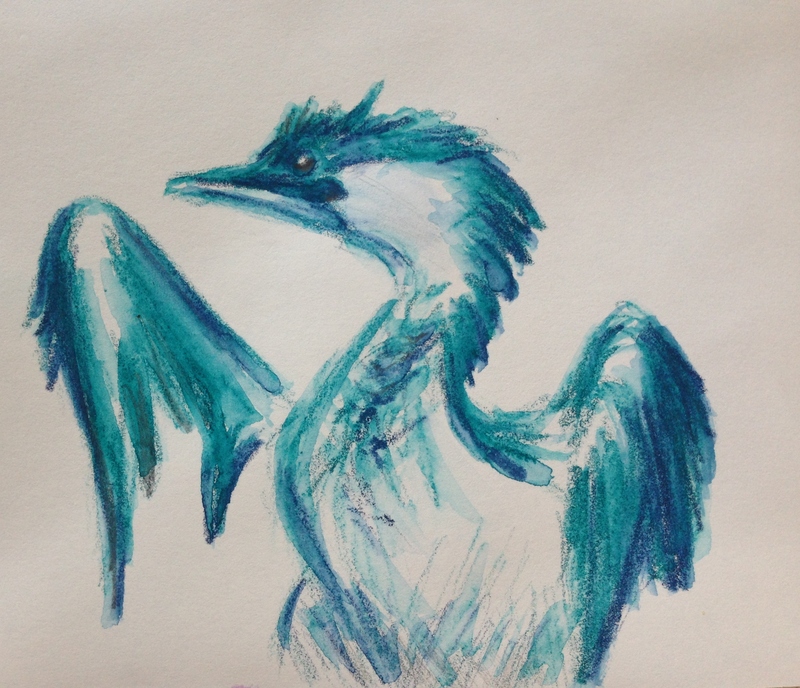 Gorgeous, fierce sketch of the Cormorant, Laura! What a fun color to use for this! Love the expression. Thanks Teri! The blues and greens in the set of 40 are wonderful! Beautiful drawing, visual poetry…in blue. Love it. Thanks, Haunani. You should write poetry! What a beautiful way to describe it (and a wonderful compliment). Have a great week! Fantastic Laura, this artwork is better than the photo, there is an element of action in the face , head and wings. I’m so glad you enjoyed it, Denis! That’s all I was hoping for with this piece. I’m working with another image from the same post also…..will see where it goes. Thank you for sharing them! Great to hear you liked these as potential sketches. Please use any other images from my blog if you want to. You will be happy to hear my memory to Charlie is that I am going to see how I can develop sketching skills. Today I bought a kit. I have an outstanding mentor in your artwork so my aim is to be 20% as good as you after 1 year. Denis, this is most exciting and I’m thrilled to hear it! I want to recommend Betty Edwards’s book “Drawing on the Right Side of the Brain”. Perhaps you’ve heard of it. That one is a gem. Many exercises in there, starting from very basic, and my guess is if you complete those, you’ll be much better at rendering form than I will! Thank you for your compliment, and I am really looking forward to your journey. Will you be sharing your artwork, do you think? Thanks Laura. When Im was a teacher my school made the brave move to Herrmann brain dominance test all the staff. That was so we understood ourselves as teachers and our preferred teaching/learning styles. In turn I was part of a team who trialled effective learning with 2 classes over 3 years. The results were unbelievable, its a long story. Anyway I was almost all right brain so to cut the story short Betty’s book seems to be waiting for me and your blog has been the motivator. AS to when I can share my future artistic skills it depends on my organisation skills, (as a right brainer there is a certain amount of procrastination and deviation along the road when being creative). Understood. So glad to have helped to inspire your journey Denis! You’ll go far with persistence, my friend! I don’t believe I’ve ever seen one! It’s really nice to experience these creatures vicariously via WP buddies. Thanks, Deborah. Thank you Laura! Do you get Rufous Hummingbirds up there? They are quite similar…their bills are smaller than the Allen’s. I’m so happy that I can share these with you! I think the ones we get are the ruby-throated hummers, Deborah. I don’t believe I’ve ever seen a Rufous here at our feeders. Oh, I’d like to see the Ruby throated ones too! you’re welcome Laura! I love the freeing of the bird within you, wings taking flight and soaring!! I’d hazard a guess- that you naturally groove into a looser “Impressionistic” approach. vs photorealism, or traditionalist, or semi abstract which means its ‘just barely recognizable’ as the object. Beautiful form Laura – love the colors used. I’m so glad you think so, thanks again! Thank you very much! I started a year and a half ago and most of what I’ve created is right here lol. I appreciate your interest. No problem 🙂 go far!! !